The American Red Cross is urging residents in Northeast Wisconsin to make sure households, schools and business are prepared for possible severe weather including rain, strong winds and possible tornados. Do this one simple step in being prepared – download one of the many Red Cross Apps to your phone! 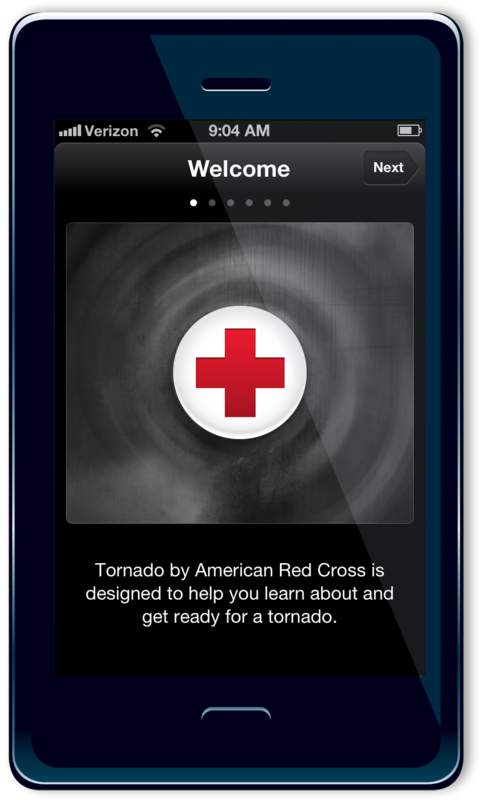 The American Red Cross Tornado App is available in English or Spanish and gives iPhone, iPad and Android smart phone and tablet users instant access to local and real-time information, so they know what to do before, during and after a tornado. The free app includes a high-pitched siren and “tornado warning!” alert that signals when a NOAA tornado warning has been issued. This feature allows users to make critical decisions and to take actions to help keep themselves and their loved ones safe even in the middle of the night. An “all clear!” alert lets users know when a tornado warning has expired or has been cancelled. The Tornado App, along with other apps, can be found in the Apply App Store and the Google Play Store for Android by searching for American Red Cross or by going to redcross.org/mobileapps. People can go to redcross.org/tornado for more safety tips. 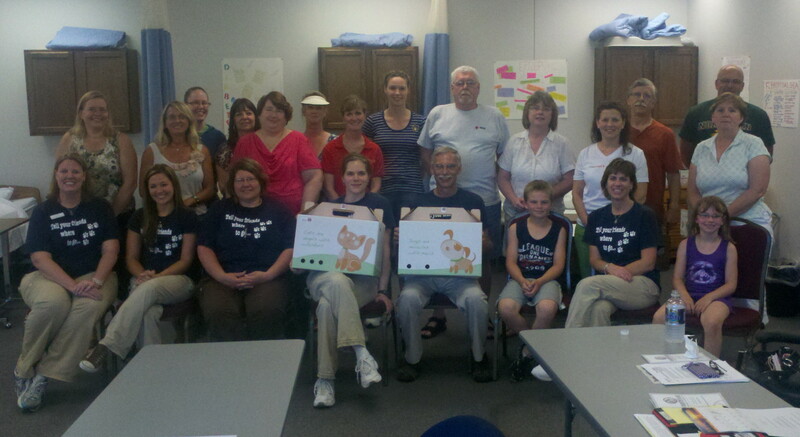 The Countrycare Animal Complex staff presenting their donations to our volunteer disaster team members. Thanks to a generous donation of fifty pet disaster relief kits from Countrycare Animal Complex of Green Bay, the American Red Cross in Northeast Wisconsin is better equipped to provide immediate care supplies for the family dog or cat after disaster strikes. Countrycare Animal Complex has been collecting donations of blankets, leashes, toys, cat litter, food bowls and pet food under the program C.A.R.E. for Paws. 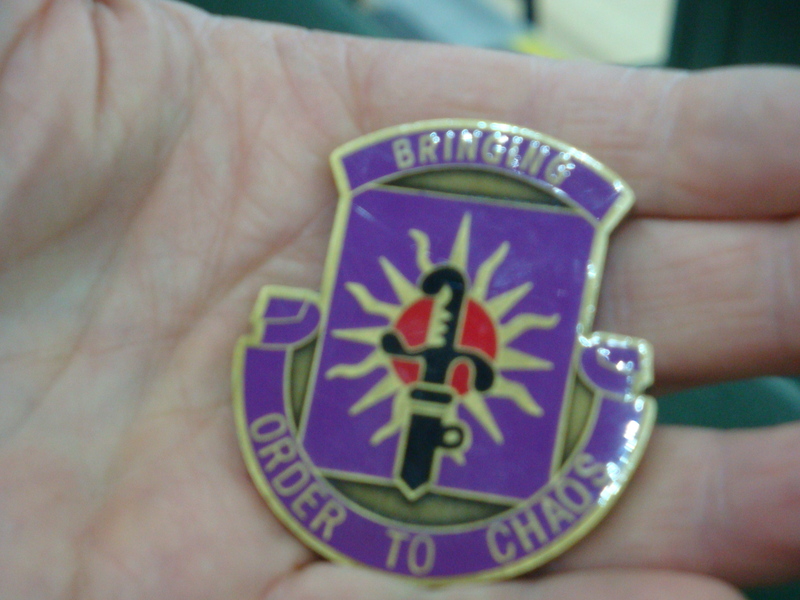 C.A.R.E. stands for Countrycare Animal Rescue Effort and was developed after staff members recognized that when a family is displaced from their home due to a disaster, they might not have what they need to care for their pet(s). “Our hope is that with these kits, people will be able to better care for their pets while they are in transition after a disaster”, said Dr. Karen Strickfaden, co-owner of Countrycare Animal Complex. On Wednesday, June 20th, Countrycare employees presented the emergency kits to Red Cross Disaster Action Team members during their monthly planning meeting at the Red Cross office in Green Bay. Each kit will contain a blanket, a leash, a toy, food, water bowls and pet food. Cat kits will also include a litter box, litter and a scoop. Once emptied, the cardboard containers used to store the pet care items can then be used as crates for cats and small dogs. “So many of our clients have pets and they are an important part of their families. In many disasters people have lost their lives trying to save their animals. 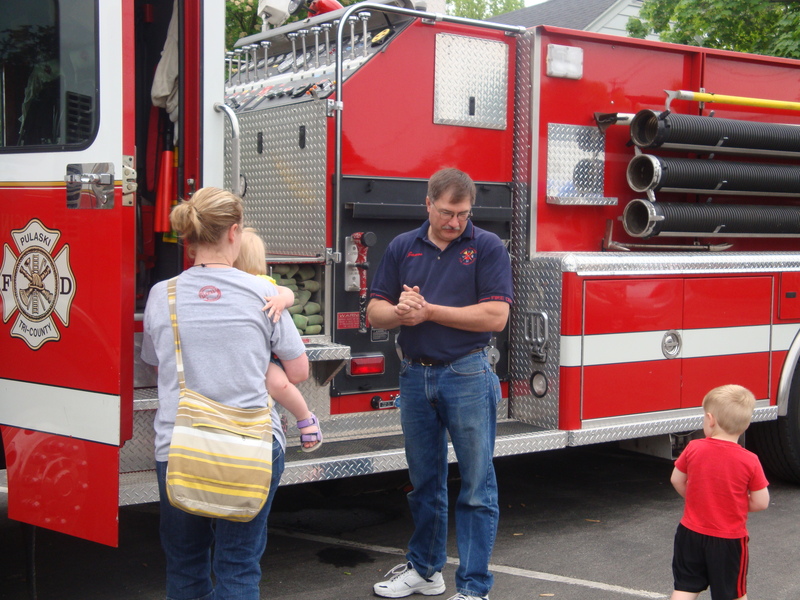 The Red Cross works with the human component of the families in helping them address their recovery needs. We typically do not have the resources to address the needs of the cats and dogs. Countrycare Animal Complex has come forward to help us fill a very necessary need in the recovery process of our families–helping them care for their pets”, said Judy Gregory, Northeast Wisconsin Regional Disaster Program Manager. Countrycare Animal Complex is a veterinary practice on the southeast side of Green Bay, Wisconsin which provides veterinary care for dogs, cats and horses. Countrycare is dedicated to promoting the welfare of animals through excellence in veterinary medicine, education, and service to our clients and community. The American Red Cross shelters, feeds and provides emotional support to victims of disasters; supplies more than 40 percent of the nation’s blood; teaches skills that save lives; provides international humanitarian aid; and supports military members and their families. The Red Cross is a not-for-profit organization that depends on volunteers and the generosity of the American public to perform its mission. For more information, please visit redcross.org or join our blog at http://blog.redcross.org. 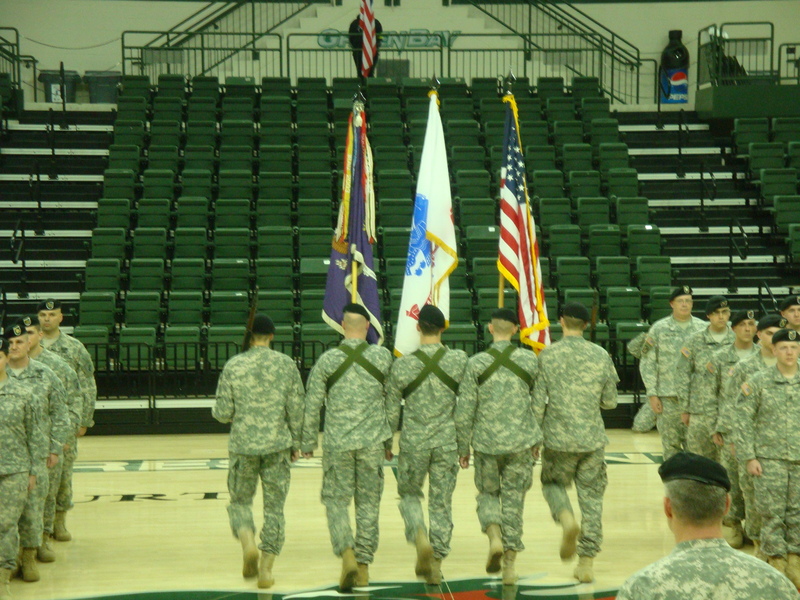 A group of Lakeland Chapter volunteers and Disaster Services Director, Judy Gregory, were among the family, friends, veteran groups, elected officials and community supporters who attended the 432nd Civil Affairs Battalion Deployment Ceremony. 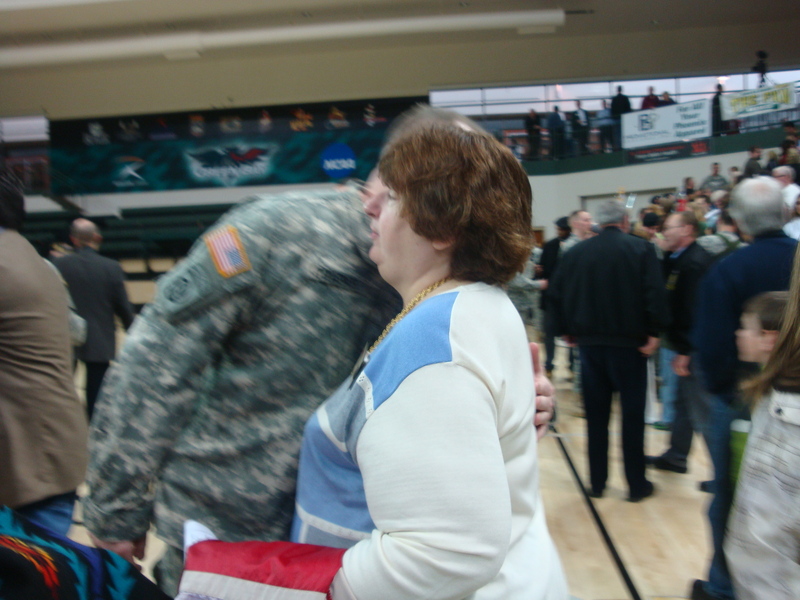 It was the official send-off before many of them leave on Sunday but it was also an opportunity to thank the families who support the military members. 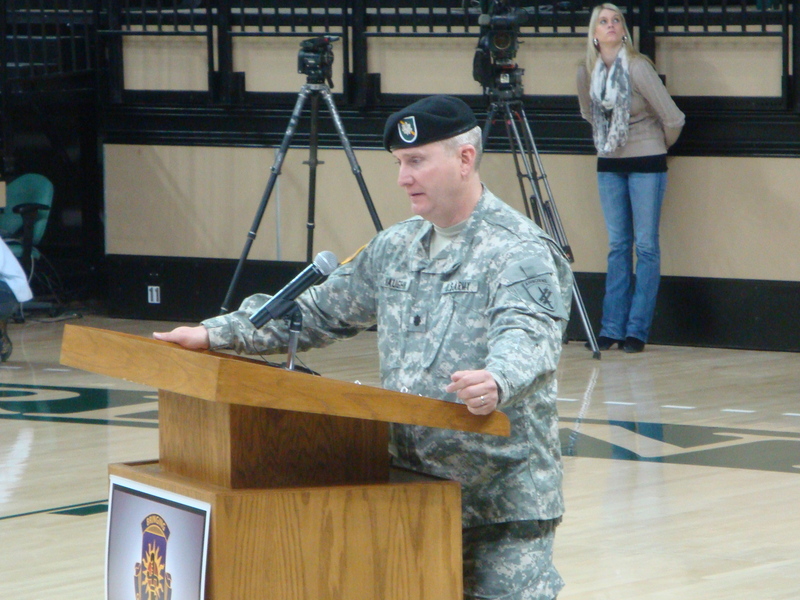 Battalion Commander, Lieutenant Colonel Vaughn noted, as he addressed the audience, that the military members of the unit wouldn’t be able to serve their country as they have if it weren’t for the support of their families. 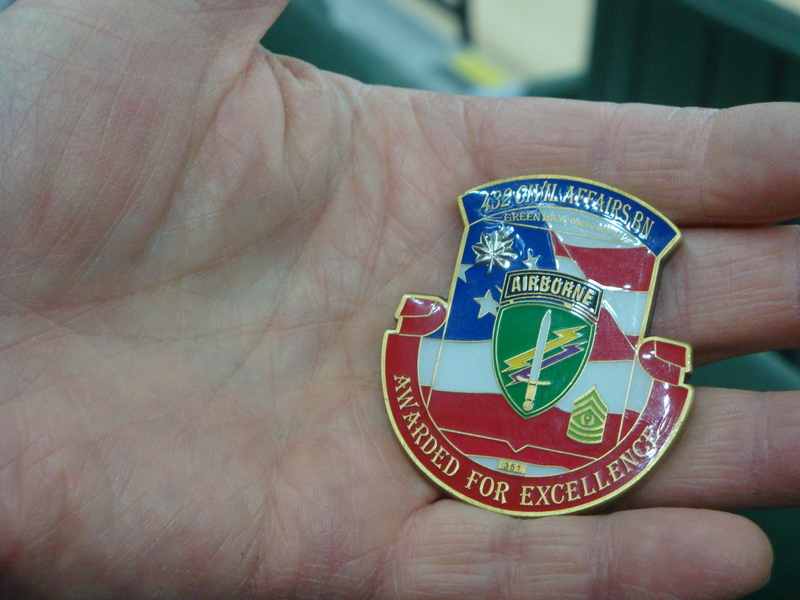 This is the third time the unit has been deployed since 2003. 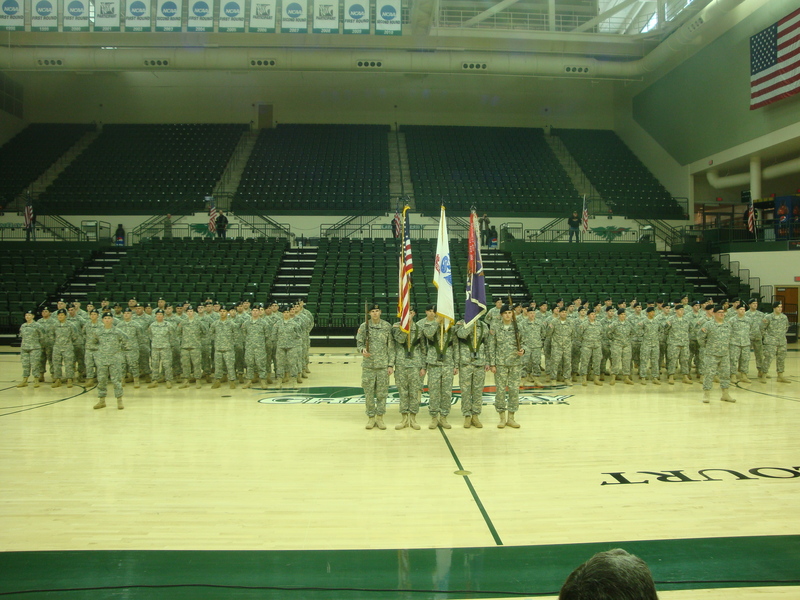 Many of the 100 members of the unit who are being deployed to Afghanistan will be heading to Camp Atterbury, Ind., this Sunday to start preparing for their June deployment. They will spend the following 9 months providing Civil Affairs expertise to Provincial Reconstruction Teams in various locations throughout Afghanistan as part of Operation Enduring Freedom. 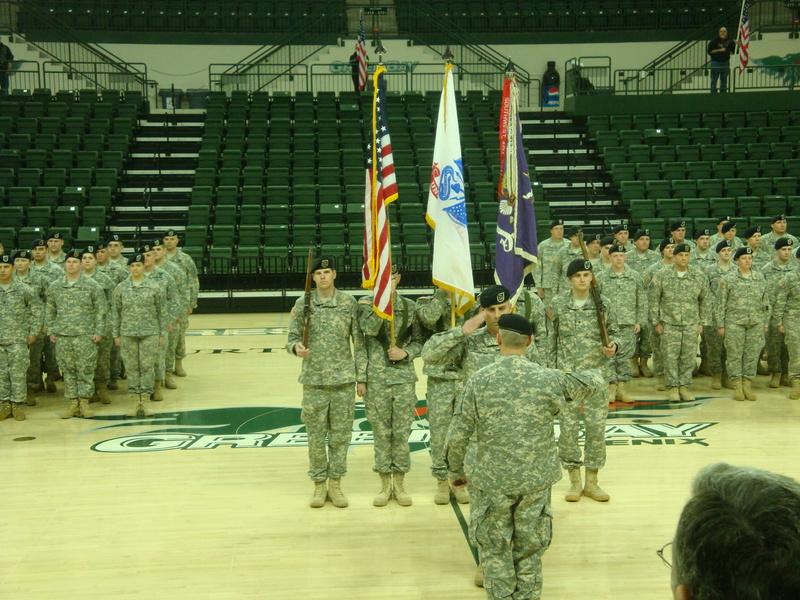 “This is a military unit we have been working with for years and have established a wonderful relationship,” said Judy Gregory, Disaster Services Director. 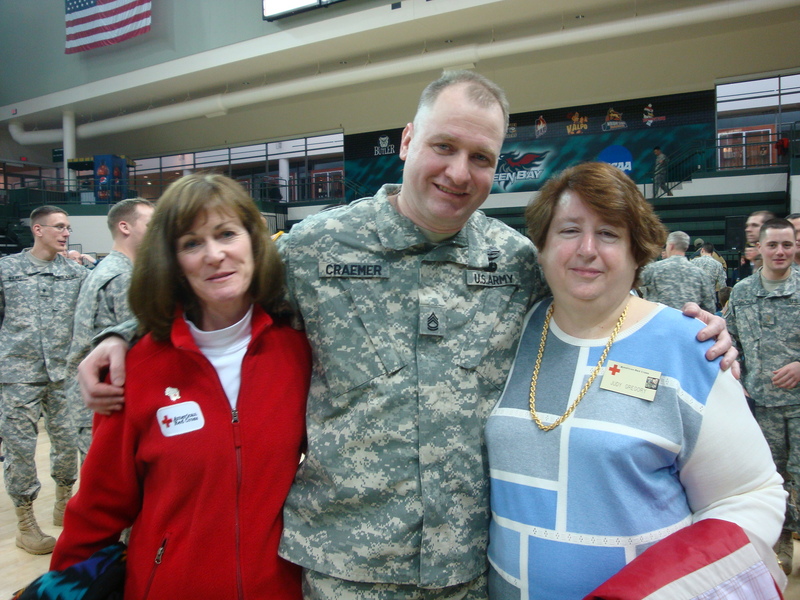 Both active duty and community-based military know they can count on the Red Cross to provide emergency communications, access to financial assistance, counseling and assistance to veterans. When the Red Cross received the call about this event they thought they were being asked to support but this time they were invited as guests. 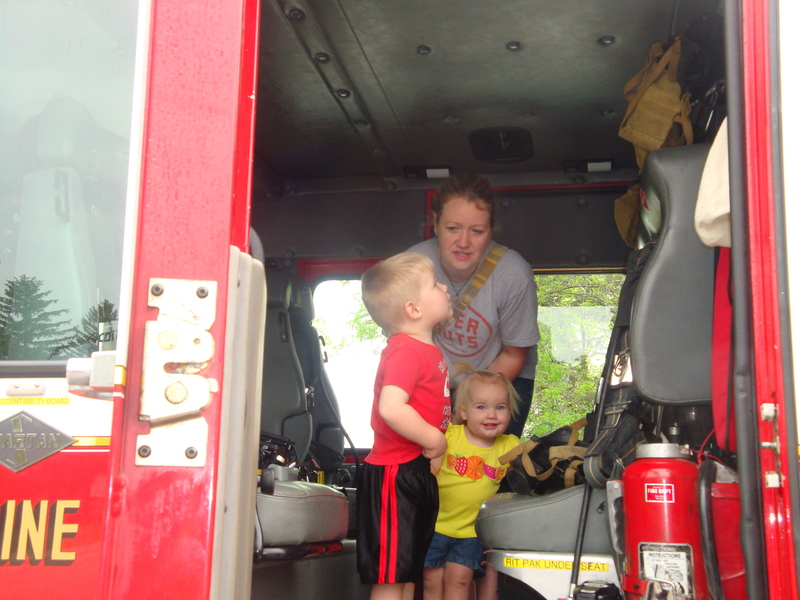 “The Red Cross in this area has an open-dialogue with the Family Readiness Group, which makes for a great partnership,” said Captain Plamann. 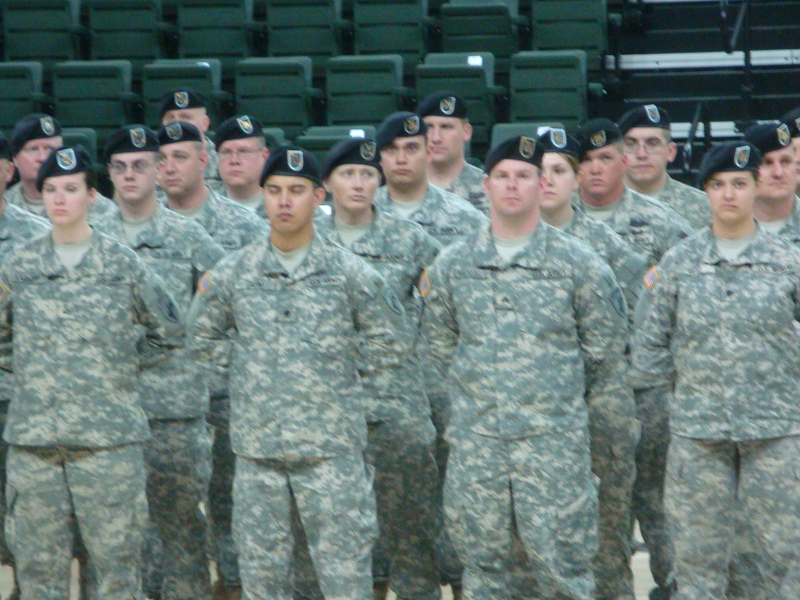 Before military units are deployed they have briefings and the Red Cross is included in these briefings to explain the programs and services the Red Cross offers through its services to armed forces program. We also offer support in other ways including providing babysitting services for military families with small children during these briefings. Three weeks of flood response. What a great team we have! At the Red Cross, our “elevator speech” goes something like this. 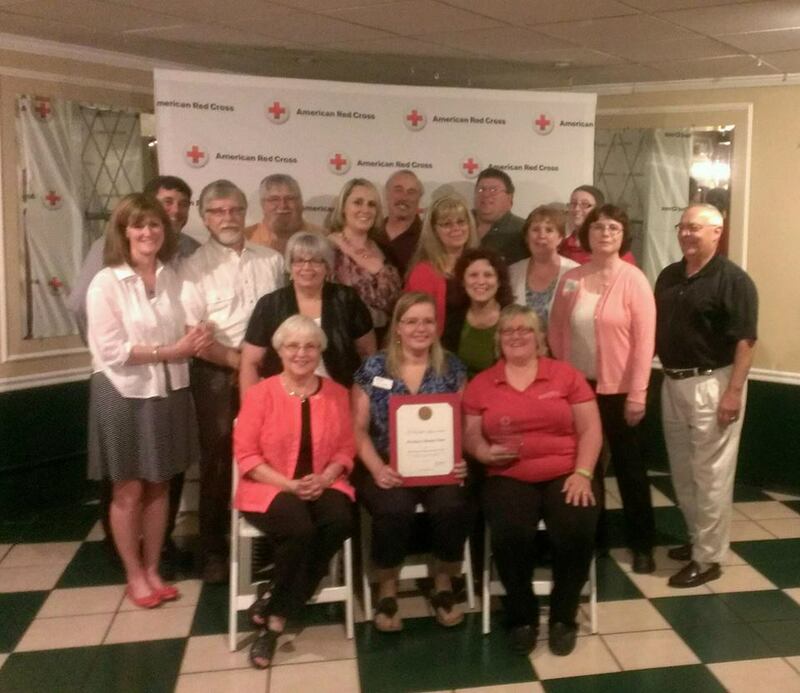 The American Red Cross empowers ordinary people to perform extraordinary acts in emergency situations. We train. We mobilize. We connect donors and volunteers to those in urgent need of a helping hand. Whether it is a hurricane or a heart attack; a call for blood or a call for help, the American Red Cross is there. The past few weeks of severe storms and floods have absolutely confirmed in my mind that our focused effort to share local resources throughout Northeast Wisconsin is working because your American Red Cross was there each and every time we were called for help! And boy, we were called often! You see, this was just the second significant test of our shared resource system since regionalization took hold under our “One Red Cross” transformation nearly three years ago. The first test came during the summer floods of 2008 and I must say our performance improved immensely. Of course having a good plan is one thing, but having a good plan is worthless without great people to make it happen. Here, in Northeast Wisconsin and around the State, we have an unbelievable team of dedicated, compassionate, and competent staff and volunteers committed to serving our communities at the highest level possible! The Howard family is staying at our shelter at Glenn Hills Middle School. You can read their entire story at http://www.redcrossinsewis.org. Together, we truly can transform a life in crisis into a life of hope. 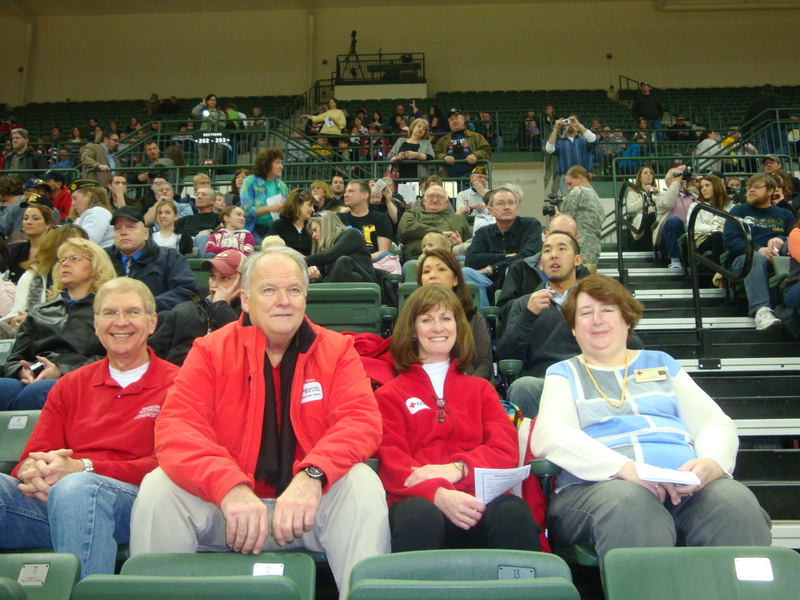 Thank you volunteers and staff for such a terrific team effort! Below is a chronological summary of the past three weeks demonstrating how effective we can be by leveraging, utilizing and deploying limited resources across the Region and State. 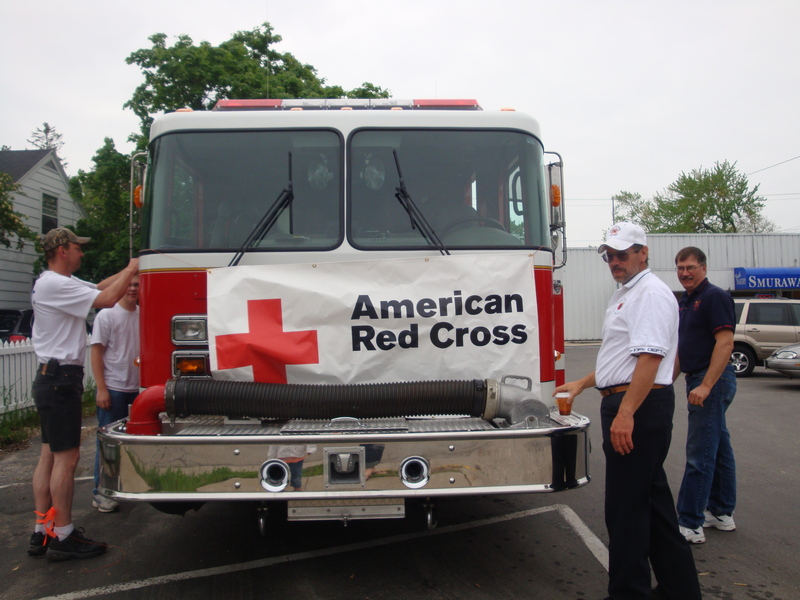 July 14 – Across the 22-county Northeast Wisconsin Region of the American Red Cross, multiple volunteer disaster action teams were activated or placed on stand-by through a coordinated regional call-down system led by Travis Waack our regional disaster manager in Manitowoc. Working with our partners in many County Emergency Management offices, we were able to secure the Oshkosh Convention Center as a stand-by emergency overnight shelter and provide Red Cross presence within County Emergency Operations Centers including Nick Cluppert our disaster manager based in Oshkosh who was in the Winnebago County EOC the first night of the big storms. Pat Schaeve, employee of US Bank, "Ready When the Time Comes" volunteer doing damage assesment door-to-door in Neenah, WI. July 17 – Utilizing our regional media database Red Cross communicators Jody Weyers and Barbara Behling were able to stay in constant contact with multiple media outlets providing response updates and useful flood safety information for the public. July 20 – Judy Gregory our disaster manager based in Green Bay received a call from the Shawno County Emergency Manager requesting Red Cross assistance due to a severe storm and possible tornado impacting the Village of Wittenberg and surrounding area with damage being reported to buildings and homes. 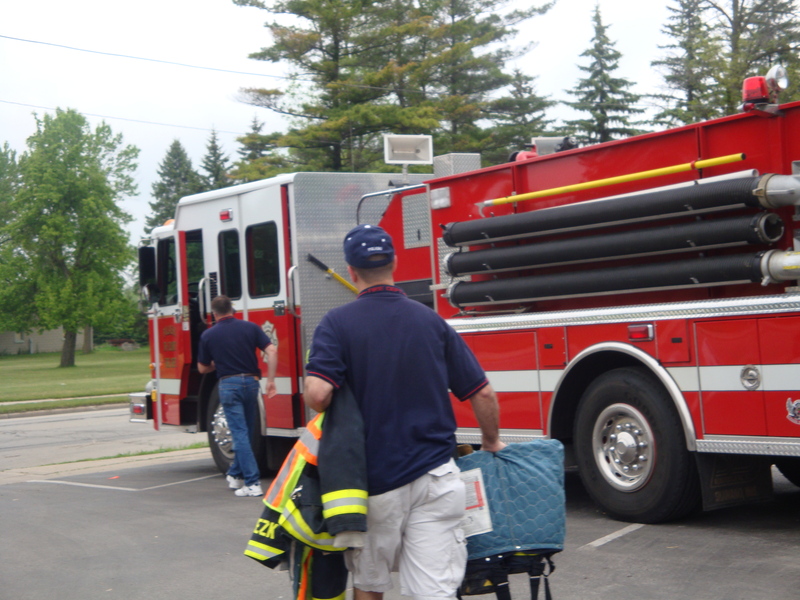 Within a couple of hours 15 volunteers were deployed to Wittenberg including an operations manager, an emergency response vehicle with 2 drivers, 4 health services workers, 1 Shelter manager, 1 Damage assessment supervisor, 6 shelter/mass care workers including a shelter trailer equipped to serve 50 people. 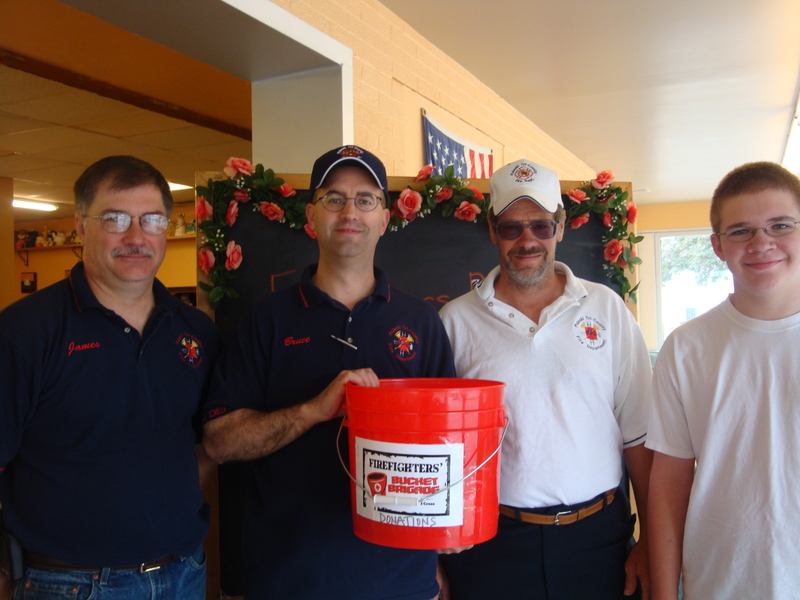 This crew was supported by 6 volunteers deployed from our Waupaca office. July 22 – The disaster volunteer team from Fond du Lac led by Joyce Keyes was placed on stand-by to travel to the Red Cross in Madison to pick up Clean Up Kits to replenish our depleted supply within the region. Ultimately, the team was not deployed as our friends in Madison and Eau Claire stepped up and pulled approximately 350 kits from their shelves and delivered them to Oshkosh and Appleton. John Kost, our disaster manager in Appleton was able to immediately deliver 40 badly needed kits to Black Creek. 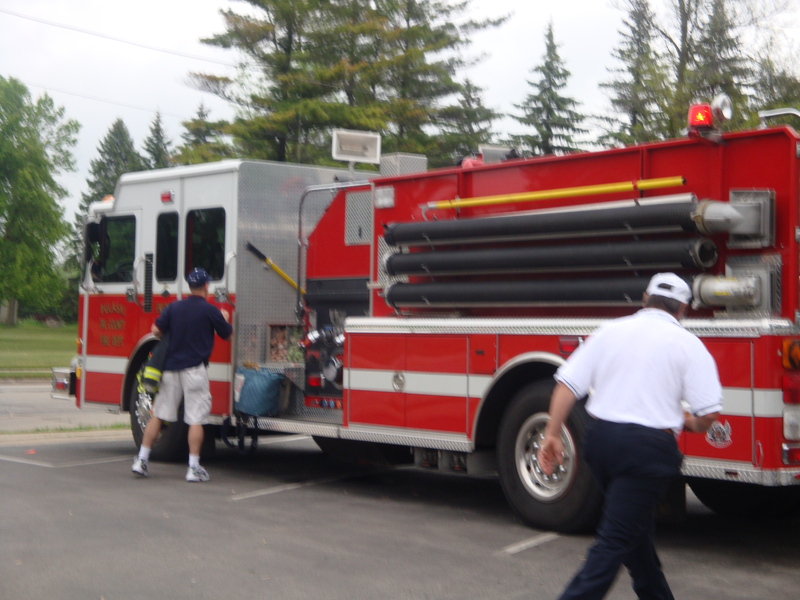 July 24 – The Scenic Shores Chapter was called by Calumet County Emergency Management to respond to the Village of Stockbridge. At approximately 4:00 AM, the Village received 4 inches of rain in a very short period of time. The heavy rainfall caused a swiftly moving flash floods to flow through the Village and into Lake Winnebago. Several homes had several inches of water in the primary living space on the first floor. The ECW Chapter delivered Clean Up Kits to Stockbridge and the Scenic Shores Chapter distributed them. The Scenic Shores Chapter also conducted a complete Disaster Assessment, served meals, and distributed bottled water. 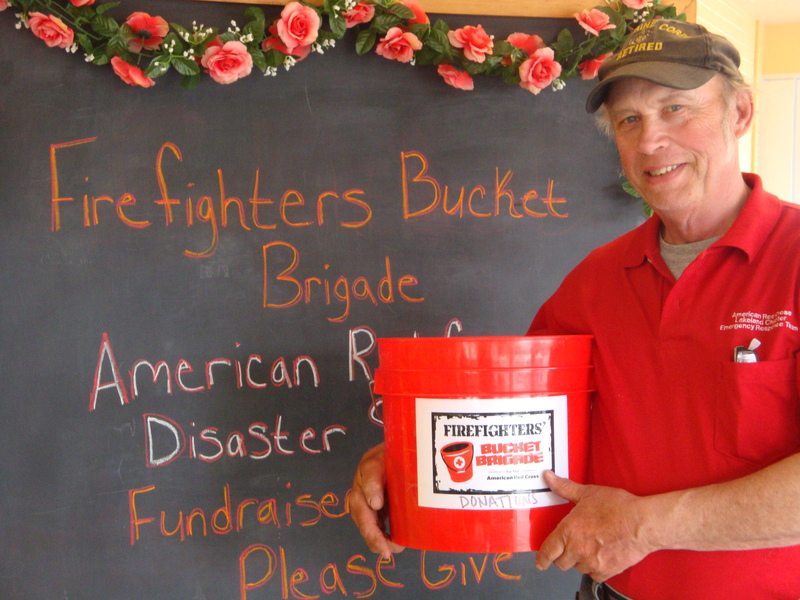 On Saturday May 22, Smurawa’s Country Bakery hosted Pulaski Fire fighters and Red Cross volunteers for a preview event of the Firefighters’ Bucket Brigade on May 27, which will have several area fire departments and locations participating in the event to raise funds and awareness for local Red Cross services. 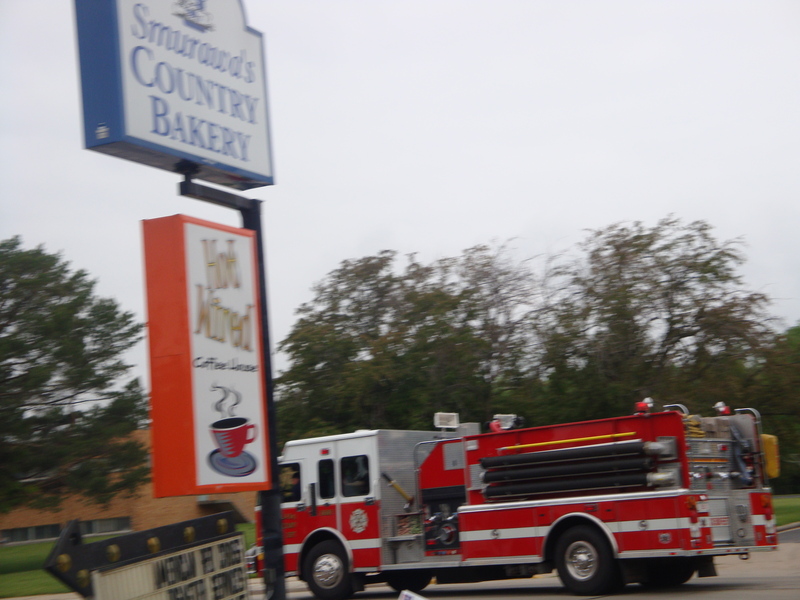 Judy Gregory, Emergency Services Director, says the community support and smells from the bakery were wonderful. 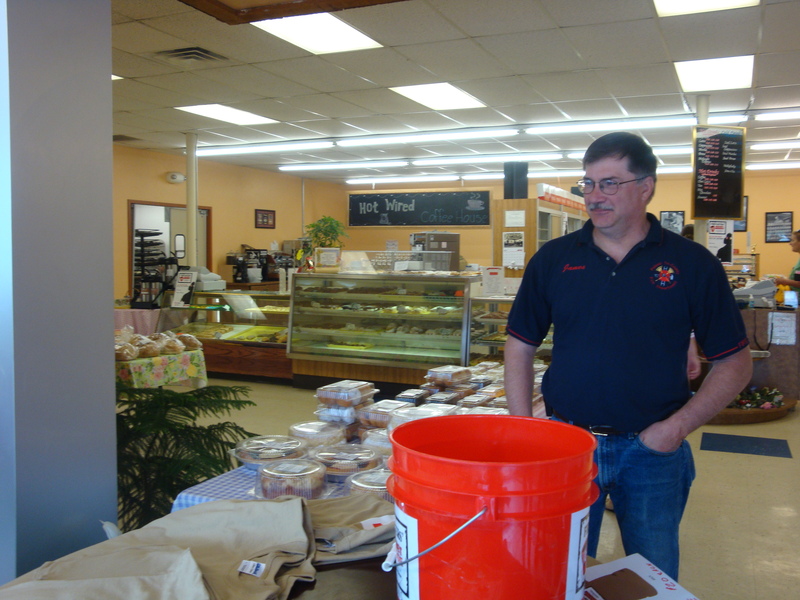 All proceeds from packages of donuts were also donated to the Red Cross by Smurawa’s Country Bakery and the with a $20 donation or more customers received a Firefighters’ Bucket Brigade t-shirt. Fire fighters and Red Cross volunteers got to meet many people who came in and out of the busy bakery. 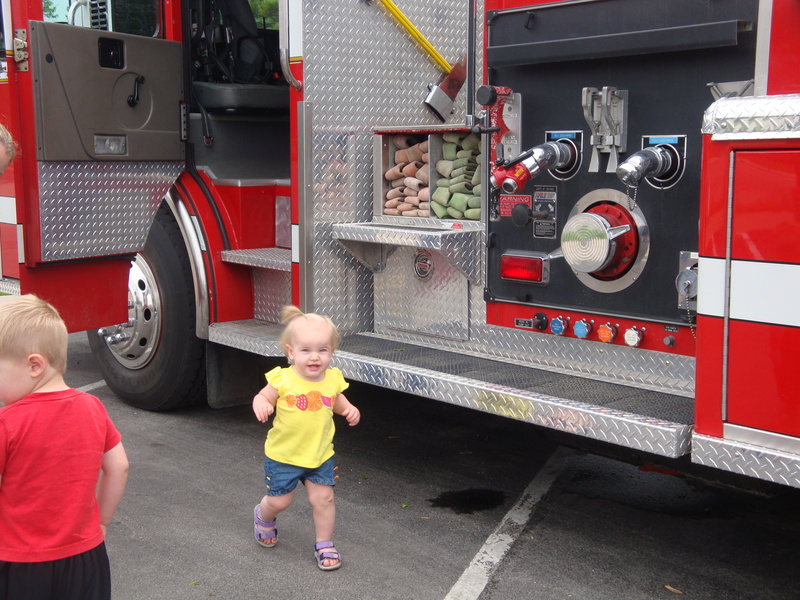 Residents got to see an up-close view of the fire truck. Always on call, the fire truck and its fire fighters did have to leave suddenly but came back shortly to finish off the beautiful day in Pulaski.